On November 2, 2011 Greece commemorates the 100th anniversary since the birth of poet laureate Odysseus Elytis. To mark the centenary of his birth, 2011 has been designated as Elytis Year by the Ministry of Culture and Tourism. 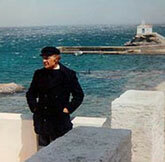 Odysseus Elytis was born in Heraklion, Crete on November 2, 1911 and died in Athens on March 18, 1996. A major poet in Greek language, Elytis is also one of the outstanding international figures of 20th-century poetry. Elytis’ poetry has marked, through an active presence of over forty years, a broad spectrum of subjects with a rarefied and passionate stylistic touch. The first collections of poetry (Orientations, 1939, and Sun the First, 1943) are joyous and radiant, celebrating the Greek landscape as an ideal world of sensual enjoyment and moral purity. His experience of the war in 1940s marks a departure from the sunny atmosphere of his early youth and poetry, colouring his long poem Heroic and Elegiac Song for the Lost Second Lieutenant of Albania (1943). The attempt of Elytis to identify himself with the nation and speak for himself and also for his country reaches its peak with Axion Esti (‘Worthy It Is,’ 1959), his central and most ambitious work for which he was awarded the 1979 Nobel Prize for Literature. The Athens Concert Hall is paying tribute to Odysseus Elytis by holding a two-day (October 31 to November 1) international conference titled Odysseus Elytis: The 20th century in the poetry of Elytis. The poetry of Elytis in the 21st century, exploring new approaches in the interpretation of his work. 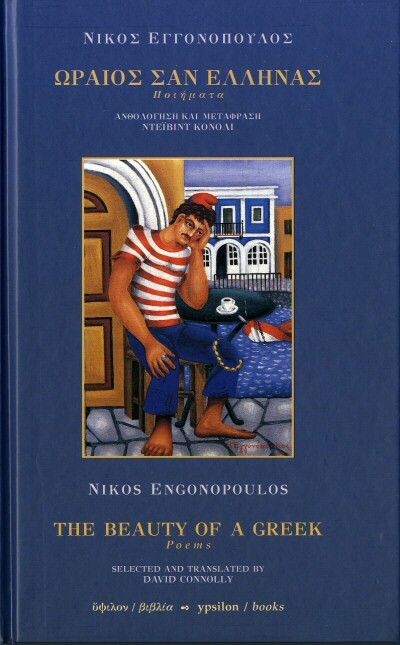 (GREEK NEWS AGENDA) “The Beauty of a Greek,” is a book by Nikos Engonopoulos, for the translation of which, David Conolly won the 2008 Greek State Prize for Translation. Having translated numerous literary works for the past twenty years, and having met almost every poet the work of whom he has translated, Conolly knows Greece even more profoundly than the natives. Despite all his experience, Conolly continues to call himself ‘an apprentice.’ Born in Sheffield, England but of Irish descent, Conolly has lived and worked in Greece since 1979 and acquired Greek citizenship in 1998. His acquaintance with Greek culture started as a young traveller to Greece and continued during his studies at the Universities of Lancaster, Oxford and his doctoral degree on how to translate Odysseus Elytis. As a literary translator,he has published some twenty-five books of translations of work by major 20th-century Greek poets, novelists and short-story writers, while his translations have won awards in Greece, the UK and the USA. Conolly has taught translation at the Ionian University, Athens University and currently at the Aristotle University of Thessaloniki. Being a genuine and devout admirer of the Greek language and its glowing poetry, Conolly has fairly won the respect of his Greek…compatriots.